Roadies Xtreme Auditions will shortly begin from December 2017. To participate in this new season of MTV Roadies Xtreme 2017-18, you must read all TNC's for Roadies Xtreme. Before apply to MTV Roadies Audition, check here How to Prepare For Roadie. At this time, auditions will become more competitive and interesting in the new season of Roadies X6. You can download here MTV Roadies Xtreme Audition Form Online. Below you need to read all the terms and conditions of Roadies Xtreme for submission of application and registration in Auditions for the selection of participants in Renault MTV Roadies Xtreme Auditions 2017. From Below, Read All The Terms & Conditions Carefully If you want to be part of Roadies Xtreme 2017. You can also check out Roadies X6 Audition Dates & Venue details. This Audition is organized by Viacom18 Media Private Limited for selection of participants for the new season of the reality show “Renault MTV Roadies Xtreme” show which is proposed to be produced by the organizers and is open for all applicant or participant who is 18 years of age and above holding a valid driving license. This Show requires mentally and physically strong participants to participate in various tasks as instructed by the Organizers. Only those Applicants who are ready for such challenges and have the psychological strength to withstand the risks and efforts involved in the tasks are advised to apply. From below, You can download Roadies Xtreme Audition Form 2017. Those applicants who are selected as per absolute discretion of the Organizers after Auditions and further screening shall have a chance to participate along with other casted participants. Get this Roadies X6 Audition Form. How to Participate in the Audition of MTV Roadies Xtreme? Log on to the website, www.mtvindia.com/roadies and get the registration form online or from any other mode/public forum as may be indicated by the Organizer. One can fill a form online or otherwise and carry the print out of the same at the Audition venues where they choose to take their Audition in. Or, Visit the on-ground Auditions as per the dates/ locations mentioned by Organizers. Or, Last Audition is tentative to be scheduled for 21st December 2017 in Kolkata. However, these are tentative dates and subject to change as may be notified by Organizer as per its sole discretion. (a) Applicants may be permitted to go for Group Discussions (“GDs”) and/or Personal Interview (“PIs”) at these cities, such as Pune, Kolkata, Delhi & Chandigarh. (b) The Applicant comes to the venue with a color photograph is preferable. The dates and locations for the GDs & PIs shall be as decided by the Organizers from time to time and the same will be informed through various communication channels across media at the sole discretion of the Organizer. (c) If the Auditions in the Applicant’s city of choice are over and if he/she is willing to come to any of the other locations of auditions they can participate at his/her own expense. The Applicant himself/ herself will have to make arrangements for travel, food and stay and bear their own expenses to participate in the city of their choice. (I) The Applicant is competent to contract and does not suffer from any disqualification or such other infirmity which may cause the contract to be void or voidable at the option of the Applicant. (II) The Applicant confirms that he/she is an adult, a resident of India, and is entitled to enter into a valid agreement. The Applicant acknowledges that he/she has voluntarily chosen at his/her free-will and own wish to participate in the Show and is willing to bear all risk, costs & consequences arising from such participation in the Show. (III) The Applicant represents that he/she is medically and physically fit and do not have present or past psychological problems. If in the past her/she has had any psychological problems or physically challenges or have been under medication for any psychological, anxiety, hypertension, depression or any other medical problems the same has been disclosed to the Organizers in writing along with a copy of the certificate from a qualified medical practitioner declaring him/her to be fit for participation in the Audition and/or the Show. (IV) The Applicant/ Participant are aware that the Show being an adventure based reality show will require the participants to perform stunts/ acts during the auditions and the Show which may be dangerous in nature and/or which may cause aversion to a normal person. The Applicant/ Participant acknowledge participation in each such stunt/ act shall be voluntary and at his/her free-will and own wish and the Participant is willing to bear all risk, costs & consequences arising from such participation. (V) The Applicant/ Participant agrees that in the event if he/ she refuses to perform the stunt/ act required as part of selection during the audition, such refusal will lead to disqualification of such Applicant/ Participant from the audition/ Show to be determined at sole discretion of the Organizer. (VI) The nature of the stunts/ acts may involve a chance of injury. The participants will keep the Organizer team or stunt coordinator informed of any problem with regard to injury or potential injury that develops for immediate assessment. The participant agrees that they have disclosed any previous physical condition which may impact on their participation in performing any stunts. The Participant shall strictly abide by instructions, rules, guidelines given to them prior to performance of any stunts/ acts. (VII) The Applicant represents that he/she has not been accused or convicted or is otherwise involved in any criminal offense and/or is not under inquiry or trial by the police or judiciary which has not been disclosed to the Organizers in writing. That the Applicant is not required to be present before any authority including policy or any court of law for a term of twelve (12) months from the date of application and has no other disability which would prevent his/her participation in the Audition or the Show (if selected). (VIII) Employees of the Organizer and/or their associate and affiliate companies/the respective contest sponsor on MTV, will not be qualified for the participation in the Audition and requested not to register. (IX) The registration does not guarantee the selection or participation of the Applicant in the Audition and such selection shall be as per the sole discretion of Organizer, availability of time and venue. The Application shall not and waives any right to question the selection process, non-selection of the application and/or the selection of any other applicant. (X) The number of Applicants to be selected shall be the sole discretion of the Organizer. (XI) In the event of a large number of registrations, the chance to be Auditioned shall be strictly on a first come first basis till closure of the Audition time. No further requests for Audition shall be entertained by the Organizer. The Organizer reserves its right to change the time of the Auditions as per its discretion at any point in time. (XII) The final participation in the Show shall be subject to the Applicant being selected in the live Audition and the execution of a written agreement with the producer of the Show. The Applicant shall not be eligible for any prize or cash for participation in the Audition or the Show. (XIII) The selected applicants shall not be obscene, vulgar, have racial or religious connotations in participation at the Audition or the Show. (XIV) The organizer shall have the sole discretion to discontinue/cancel the Audition and/ the Show at any point in time and the Applicant shall not raise any claim due to such discontinuation or cancellation. (XV) Taking part in the registration process shall be deemed to be consent by the Applicant to receive promotional messages about the shows and programs of the Organizer and messages relating to the Show from the Organizer or any third party so authorized by the Organizer. (XVI) In the event of any violation to the aforementioned or in case it comes to the knowledge of the Organizers that the details submitted by the Applicant in the application are not correct, the Applicant shall immediately be disqualified from being considered to be a Participant for the Auditions and shall solely remain liable for any action (criminal/civil) arising therefrom. (XVII) The Applicant hereby agrees to indemnify the Organizers against any claims that might arise from their actions or omissions or be arising from any representations, misrepresentations or concealment of material facts. 1. The Applicants shall report to such venue as may be informed by the Organizer at the date and time so mentioned and any delay in reporting shall automatically disqualify the Applicant from participating in the Audition. 2. The Applicants shall be required to perform. 3. The cost of travel and accommodation for attending the Auditions at the venues as informed by the Organizers shall be borne solely by the selected Applicants and the Organizers shall not be liable for the same. 4. All Applicants shall be required to execute an agreement or sign a form containing terms and conditions as required by the Organizers before allowing participating in the Show. 5. The Participant hereby represents that he/she is not under any exclusive contracts with any other third party/ agency or is not under any kind of disqualification under the law to enter into an agreement with the Organizer as the case may be. 6. All Applicants shall keep maintaining the properness of the Audition venue and shall abide by the rules and regulations thereof. Further, the instructions of the Organizers shall be adhered to strictly. Any Applicant/Participant who acts in contravention of the instructions of the Organizers or creating nuisance either to the Organizers or the other Applicants shall immediately be disqualified from participating in the Auditions. 7. The Applicants shall at all times keep the selection process and all details regarding the Show which he/ she might be informed of or which he/ she might learn or come to know of as an Applicant/Participant in the Audition or as a shortlisted potential Applicant. The Applicant shall at no time interact with any other third person or to media or give any interviews on his participation in the Audition or also potential participation in the Show without prior written consent of the Organizers. 8. The Organizers hold all the right to change or modify any terms and conditions or process of the Audition, at any time at their own judgment and without any preceding notice & without distribution any reason. 9. The decision of the Organizers in connection with the Audition will be final and binding and is non-contestable. In case of any conflict or variation in regard to this Audition, the selection of the Organizers shall be ultimate and valid in all situation. 10. The selected Applicants shall be intimated by the Organizers directly. The Organizers shall not socialize any query, compatibility, and inquiries on the way of action of the Audition from any individual whomsoever. 11. Apart from the entitlement to be part of the television reality show “Renault MTV Roadies Xtreme” subject to selection and written indication by the Organizers to such Applicant, the Applicant or his/her legal heirs will have no other rights or claims against the Organizers. 12. The Organizer shall not be liable for any loss, injury, mental/psychological issues like anxiety, depression, stress etc. or even death caused to the Applicant during his/her participation in the Audition or the Show. 13. The Applicant acknowledges that the Organizer shall not be liable for any mishap, injury, accident, untoward incident, physical harm of any nature, death, loss of life or limb, etc., caused to them, either before, during or after the Audition or the Show; and the same shall not be attributed to the Organizer and the Organizer shall not be held responsible towards the same nor shall be liable to indemnify or make good any claim being raised against it, for whatsoever nature. 14. The Organizer will also not be liable for any loss of earnings, employment or otherwise caused to the Participant and arising as a result of his/her participation in the audition or the Show if selected. 15. The Applicant understands that getting shortlisted in the Audition is only a preliminary step towards participation in the Show and it shall be the absolute and sole discretion of the Organizers and Viacom18 to allow participation based on creative requirements and the Applicant acknowledges this right of Organizer without any dispute or claim. 16. The Organizer shall shortlist Applicants/Participants after the auditions at all venues as required out of which only a limited number of participants shall be selected for further selection processes and/or final participation in the Show. Even after final selection for the Show, the Organizer shall have the absolute right to replace any of the Participants as per their discretion and creative requirement. 17. The Audition and the participation in the Show shall be subject to the jurisdiction of competent court/s at Mumbai alone. 18. All Applicants shall have to carry a copy of a document identifying him/her as the citizen of India and valid proof of his/her permanent and current address and age. 19. All registrations shall be subject to completion of the procedures by the Applicant as per instructions are given by the Organizer or the authorized representatives of the Organizer. The Organizer shall not be liable for any failure of receipt or incomplete registrations. The Applicant shall retain the registration code, if any, duly completed registration form and provide the same on demand at the Audition venue along with necessary identity documents and proof of age. The Organizer may disallow entry to the Audition in the event the Applicant is not able to provide/ produce the registration code, if any, duly completed registration form or the documents as required. On verification, if any of these documents are not found to be in order, the participation of the Applicant/Participant to the Audition or the Show may be terminated immediately by the Organizer. 20. Apart from the registrations, the Organizer may at its discretion provide a chance for entry to the Audition for unregistered people also. 21. Participation in this Audition implies acceptance, without protest, of all the rules set forth by the Organizer for the Audition and the Terms and Conditions herein contained. Acceptance of the Terms and Conditions by the Applicant irrespective of such participation leading to final selection or not, constitutes permission for Organizer, and its affiliates to click photographs, record videos of the Applicant and use the Applicant’s name, photographs, likeness, voice and comments for advertising and promotional purposes in any media worldwide for purposes of advertising and trade without any additional compensation whatsoever. 22. On request of the Organizer, the Participant shall also make arrangements for the Organizer to have access to his/her residence, workplace, favorite hangouts, pets etc. and obtain necessary permissions from his/her parents, siblings, friends, colleagues to be photographed, interviewed and to record or click their photographs, videos etc. 23. Any photographs, videos etc. submitted to the Organizers or recorded by the Organizer during the Audition or registration procedure shall on submission/creation become the property of the Organizers and shall be available to the Organizers for exploitation throughout the world in perpetuity. The Applicant shall ensure that the photos or videos submitted by him/her in any public domain or their performances are not obscene, vulgar, defaming, denigrating women or children, hurting religious sentiments, depicting violence or shall not infringe the rights of a third person. 24. The Applicant expressly agrees that in addition to these terms and conditions the Applicant shall comply with any terms and conditions that may be stipulated by Viacom18 and/or its parent, subsidiary, and affiliate companies in relation to the Audition and Show and any other rules, regulations, policies, etc. 25. In the event of any violation to the aforementioned, the Applicant shall immediately be disqualified from taking part in the Auditions and shall solely remain liable for any action (criminal/civil) arising therefrom. 26. The Applicant hereby represents and warrants that he/she will comply with all the rules associated with the Audition and Show including but not limited to the Terms & Conditions mentioned herein and associated with the Audition and Show and that the Applicant shall personally be liable for any breach thereto. 27. In the event of unforeseen circumstances beyond the control of the Organizer, and the Prize not being made available to the Winner, or the meeting being cancelled, the Winner shall not have the right to claim any damages or monies from the Organizer and by participating in this Contest the Winner waives his/her right to make any such claims against the Organizer. 28. Under no circumstance, unless due to willful misconduct or gross negligence, shall the Organizer and/or their directors, employees, officers, affiliates or subsidiaries, be liable to the Applicant/Participant and/or any third party for any lost profits or lost opportunity, indirect, special, consequential, incidental, or punitive damages whatsoever, even if the Organizer has been advised of the possibility of such damages. The Applicant/Participant specifically agrees not to file in person/through any family member and/or any third party any applications, criminal and/or civil proceedings in any courts or forum in India against the Organizer and/or their directors, employees, officers, affiliates or subsidiaries to claim any damages or relief in connection with the Audition/Show. 29. The Applicant/Participant grants the Organizers irrevocable consent in perpetuity to the use his/ her name, photographs, videotape taken during the Audition, in any and all applications including but not limited to advertising, commercials, promotion, stories, text, articles and commercial exploitation, in any and all media forms, including but not limited to radio, broadcast and television, newspapers and magazines at any time without the Applicant/Participants further knowledge or consent. 30. The Applicant/ Participant shall not, without Viacom18’s prior written consent, publicise in any manner including on social networks nor discuss with any party, including without limitation the press, about any information relating to this Audition/ participation, the Show, your participation/appearance, the production team or any other participants in the Show or any other information which may come to your knowledge (including without limitation in relation to Viacom18, producer or any of its employees, consultants or vendors). 31. The Applicant/Participants hereby agree and undertake that they shall not accept or undertake to accept or give or undertake to give, either directly or indirectly, any gifts, commission or other favor, of any kind whatsoever, to facilitate they are winning the Audition. Any knowledge of such an act shall lead to immediate disqualification of such Applicant/Participants and the Organizer shall be entitled to take any and all action(s) against such Participants, as deemed fit by it. 32. The Applicant/Participant hereby agrees to fully indemnify the Organizers against any claims for expenses, damages, or any other payments of any kind, including but not limited to that arising from his/her actions or omissions while participating in the Audition or the Show or arising from any representations, misrepresentations or concealment of material facts. I have read and understood the terms and conditions for my participation and I hereby confirm to abide the same. All Information Given By Me Is True To The Best Of My Knowledge with sign/date/time. 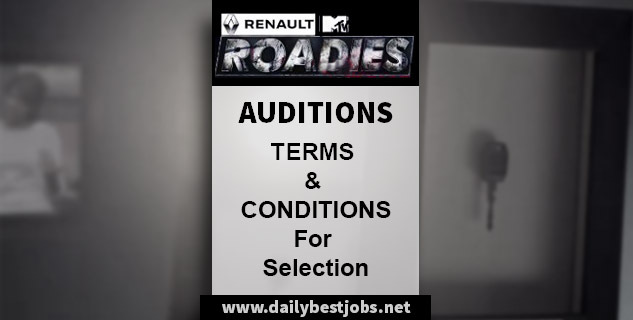 The above terms & conditions by Renault MTV Roadies Xtreme Auditions For the application, registration submission & participants selection for Roadies Auditions 2017-18. Subscribe your email for more updates on Roadies and keep visiting our website. Share on Facebook & other Social Sites. @#RAN sir,i am 17 now next year i ll be 18 i wish if u could suggest me anything so that i can prepare &train myself for roadies auditions in 2018. it will be an honour for me & if u could help me it would be an honour for me & i ll take it as an motivation . if u get some time please reply me ..
@#RuN sir,i am 17 now next year i ll be 18 i wish if u could suggest me anything so that i can prepare &train myself for roadies auditions in 2018. it will be an honour for me & if u could help me it would be an honour for me & i ll take it as an motivation . if u get some time please reply me ..
You must well prepare for roadies audition & registration for the next year, give an audition, attend GDs & clear PIs of Roadies in front of all judges. Go for Roadies Auditions 2018 on Next Year. You must hold a valid driving license as well as a passport for details & photo verifications. If may the journey will decide out of India like Nepal, then Passport requires. Licence k bina audition ni de skte??? License required in Roadies because contestant has to drive a car at any moment whether in the task or in a journey.